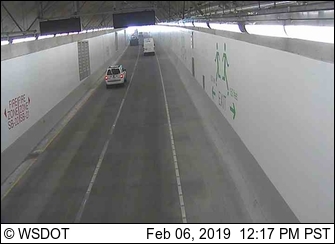 Let’s just say as much as I enjoy celebrating infrastructure, the “Revenge of the Car” Tunnel was something I really wish our pro-transit politicians had never done and certainly never celebrated. The world needs more SkyTrain and more ST3 and more housing close to transit, not more superhighways for super sprawl that’s ruined so many lives. If it is true that Gov. Inslee’s comments — the guy who is probably going to attempt to run for POTUS on a climate platform — said nothing about climate at the ribbon cutting, it’s an ugly look and it won’t be forgotten. The silence is deafening. Regardless, if he is indeed serious about a climate-platform-centered presidential campaign, he should have skipped the event altogether. Gov. Inslee didn’t sign the bill authorizing the car tunnel. He signed the bill authorizing the 2015 highway spending spree, which also authorized the ST3 vote and the vote on the Kitsap cross-Sound foot ferries. He could have partial-vetoed the freeway spending spree, and at least insisted on a public vote, if he were really serious about climate change as more than just a talking point. He cheerled the spending spree. That is what disqualifies him from the mantle of The Climate Action Candidate for President. McGinn was spotted at the event, too. I find it pathetic under both Governors Gregoire & Inslee gas tax increases didn’t get a public vote but transit tax increases did. It’s one reason why I was once upon a time a Transit Republican and now an independent. Really unfair to make proponents of sprawl to have all their resources to attack us, but not defend tax increases for growing their vision. I do salute former Mayor McGinn for going as a member of the general public trying to keep potential gubernatorial candidates & current Sound Transit Boardmembers honest. Frankly, if I had my way, we’d have for Governor the Republicans run the most pro-personal car, pro-sprawl, pro-gun, anti-abortion, pro-school choice, tax cutting candidate possible since they got nothing to lose and the Democrats run Jessyn Farrell or since Martin H. Duke has sworn off seeking any elected office, Frank C. our STB editor-in-chief – both of whom are moderate enough for the critical suburbs. Sorry my Democratic Party friends; but Cary Moon & Nikkita Oliver are most definitely unelectable in the suburbs. Notice I didn’t say Dow Constantine, Dave Somers, or even Claudia Badassuchi. Let’s just say Sound Transit Boardmembers Constantine’s & Badassuchi’s shared enthusiasm for the new car tunnel is cringe-worthy and as far as Boardmember Somers can we say the guy decided on a flip of a coin whether or not to appease the public comment mega-trolls when Sound Transit Board Chair that meeting. Just my thoughts on the upcoming gubernatorial election. While there’s plenty of blame to go around for the tunnel, I think you can hang most of it on Chris Gregoire, with support from Ed Murray and Frank Chopp. None of these are what I would call pro-transit. They were, like many politicians, happy to say nice things about buses to transit as long as big highway projects got funded. I am instructing my readership to go out and take transit related snow pics. Bonus points for pics of 3 or more buses stuck in a row. Great idea! Unfortunately, the Microsoft Connectors were all canceled today, so I don’t have any from my now-on-foot commute. But you read what you yourself post, right? Do you have any pics? Seriously? Microsoft is compelling workers to show up today? We were told to go ahead and “work from home,” but I live close enough that I decided to actually come into the office (as an excuse to go outside in the snow, if nothing else). There’re a few other people from other teams here, but nobody else from mine. How about updating camera shots showing how empty The Tunnel is on Day 1? 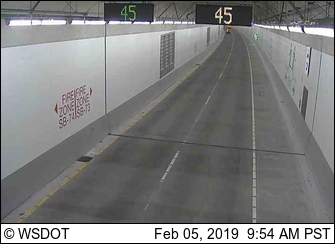 We can’t judge the tunnel’s performance on a snow day since all the other streets are down 90% too. One of the things I’ve noticed about snow days is that streets that are usually packed have one or two cars per minute. Sorry didn’t take pics, but at 7 this morning at Aurora and 85th, 3 buses stuck trying to climb the hill West of Aurora and 5 more stacked up East of Aurora. When I got to the tunnel, it was empty and clear. Has I known about this I’d have taken a picture of the f line I was on that I had to walk away from. There was an f line to burien jackknifed near the Tukwila sounded station, and it blocked both the one I was on and the next two from advancing. Walking to 180th and speedy I went. Three cars in the tunnel on Day 3. Here ya go, Sam. But Brent, I said “stuck in a row”. They should have listened to me. Unfortunately “snow routes” does not include not throughrouting the 21 from the five, so the 21 is not running today. Such great planning. Hardly anything is moving at the moment, except Link Light Rail. Yep. LR is virtually immune to snow events like this. Can’t say that about the other modes. Regarding tunnel volumes, it is day 1 and a snow day at that. Volumes are down 90% generally, and the tunnel is dry. You can zip right through, just need to be carefully at the entrance and exit. Walking commutes are immune to snow also. it depends on the hills and ice. But if everything else is closed, where are you going to take it? All UW classes are cancelled. Most flights are cancelled. There are no major sporting events today. And most businesses are closed. My last apartment was just northwest of Bellevue & Thomas in the alley. It was a steep scary hill walking down from Broadway, and the 47 doesn’t run in the snow or is rerouted to Broadway. Walking southward is flat but there’s still a steep hill between the street and the alley, and I couldn’t walk it without falling at least once. In the week-long snow of 2008 I managed to get in to my apartment and didn’t come out until the snow melted. Now I live closer to Pine Street so it’s easier. And I’ve discovered from previous snows that Pine is the flattest east-west street in the area, so you can walk from Pike Place all the way to 14th pretty easily; the only trouble is over the freeway where it gets icy. Link is running close to normal with some midday 2 car trains mixed in. There also seems to be a speed restriction along MLK. I saw an early inbound train (about 545am) that was very full. The southbound train I just took had a lot of riders with luggage. Some Metro routes were running convoys today. I saw 2 outbound 40s and 2 outbound 255s running headlights to tail lights in downtown Seattle, but that’s always expected during snow events. There also were a few people playing on the Viaduct this morning. Lots of footprints in the snow but no snowmen. Not completely immune. If you get enough ice in the flangeways from packed snow it can be an issue. Snow sweepers were developed to solve this problem. Yesterday evening, I put on microspikes to walk to the grocery store. You strap them over your shoes, and they give up a much better grip, allowing you to walk on snow and ice up and down slopes, without slipping and sliding. While they’re primarily designed for trail hiking, they work great in cities, where people don’t bother to shovel the sidewalks. The 21 from what I could see was barely running—if you weren’t fortunate enough to take one of the two that would arrive together, you waited 45 minutes——–for nothing to arrive. A friend who waited for the 21 decided to drive to work downtown, and gave me a lift:) I have to say that imo, the DOT did a less than stellar job on I-5 N; There was a lot of patted down brown snow that remained on the highway. It’s like they put some deicer or salt down then didn’t much else, or at least did do enough shoveling. All sounds completely normal. Starting with, unfortunately, those lines of stationary in-service buses. Which can in no way be blamed on the pro-sprawl interests, villainous though they be. Unless they’ve got operatives falsely assigning buses. Isn’t there someplace on line you can note that too, so nobody sleepy has to check a bulletin board when they’re in a hurry to get those buses out there? Am I right that none of this morning’s “stationaries” are chained forty footers? And Joe, trust me on this one. Give it ten years and there’ll be short headway express bus service from West Seattle Junction to Greater Green Lake. Absent the Viaduct-Related Views, toll-assessed underground parking will lose its appeal a lot faster than anybody’s car will soon be able to move in there. I won’t be able to afford a coffee at Greater Green Lake, but can’t fight the market long as it’s got a butcher’s chainsaw and I’ve only got a rusty cleaver. Soon as Skagit County’s got ST livery, the war’s yours. By the time you retire, Cross Kirkland Corridor could carry same Finnish streetcars as CCC. If it’ll run tires it’ll carry buses, and if it’ll hold wheels it’ll do same with tracks. there are (were?) dual-mode artics with the rearmost axle driven by the diesel and the middle one by the electric motor. seem like that could be done with a (low-floor) hybrid setup, hopefully it would fare better when it gets slippery, esp with a decent traction-control system. Uh oh. I was afraid of this. It’s only Monday! By honored custom, I seen to recall that blizzards are required by old past practice to make their entrance precisely at rush hour on a Friday afternoon. Now looking at the calendar, I see that Independence Day is a Thursday. Was hearing on the radio that climate change often yields counter-intuitive results. The very forces that yield record heat can also be responsible for extreme cold, all accompanied by serious turbulence. So not sure I even want to be on Link at pm rush first Thursday this July. Nature gets vengeful when crossed. Or, like the Almost Live episode where the Seattle weathercaster goes berserk from all the ridicule and starts screaming at a flip chart showing a solar tornado…first flake on 7-1-2014, please just leave the artics in the yard. 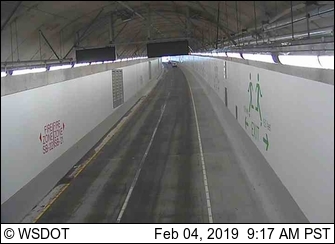 The 99 tunnel will look nice when it is retrofitted for light rail in 20 years. In 2024 Seattle voters will approve building a new light rail line that runs along Aurora that will correspond with a rebuilding of the Aurora Bridge. Most of the line will run in the median of SR-99 with 5 at-grade crossings in North Seattle. There will still be one lane of general traffic in the SR-99 tunnel next to the trains. After downtown the line will continue south to serve Georgetown and will then follow SR-509 to serve White Center and Burien (or connect to Sea-Tac). 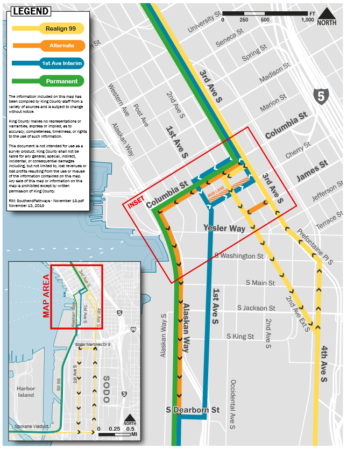 There will even be a stop added in the middle of the tunnel with a passageway connecting to Westlake. The new Fremont stop on the Aurora line will include an elevator transfer to the new underground Ballard-UW line. Heard on this evening’s news that the new tunnel has been experiencing some serious slow-downs in both directions. Too bad nobody down there can see the stars that’ve just come out, in addition to all the City’s lights. Like they used to when they were stuck on the Viaduct. Much interested in traffic stats as they develop for Western Avenue and Elliott. Where two miles in first gear (ok, range or whatever it is for a hybrid) will at least be free of charge. Might induce me to ride a Deep Bore Tunnel reserved for buses only during hours when left to its own devices, the lanes will all be underground parking. That’s one saving grace of a highway, that I learned about from a trainman on light rail in Sacramento. There’s always more than enough structure to convert to rail, though doesn’t hold other way around. For our own near future, even less likely than it is necessary. Opening day bus tours proved that bus platoons get through with speed and grace. We don’t even have to do it all day. Or even every day. Well announced and scheduled in advance. When, and how, it makes sense. Unforeseen opportunity for that description of this project, don’t you think? Traffic stats for Western, Mark? There is none. It’s glorious (or at least will be until the new Alaskan Way is connected to Elliott/Western). Those streets were car sewers before and are now quiet…and you don’t have to wait forever to cross. If I were a cyclist and that were an option for me (I’m not; I refuse to ride in this city) I’d use those streets as often as possible until they go back to being sub-freeways. It’s only a shame that there’s no real way to utilize them for buses. Nice 18 minute walk to the CT #810 stop in Mountlake Terrace, good change in scenery. I have snow tires but didn’t want to risk it when walking to the bus is fortunately an option. Unless it’s the midwestern polar vortex, it’s not too cold, people just don’t dress for the cold. CT is not even trying to run the articulated busses in the 8 inches of snow and icy conditions, even with the smaller bus, that driver was taking it real slow, even on the highway and in U District where 45th NE was already pretty much bare. They have to take some smaller busses off the local routes to do the Seattle expresses and SWIFT, so I kind of feel sorry for those who depend on the local routes. 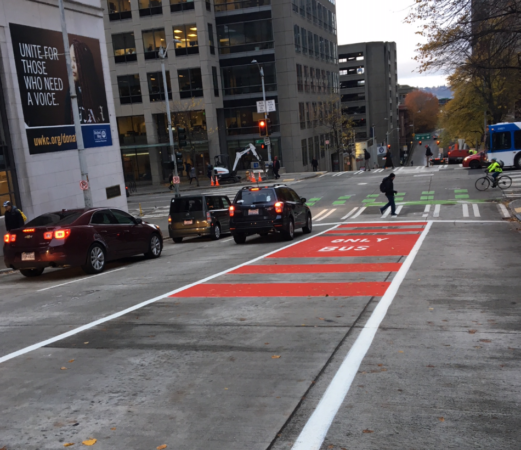 Something that will be greatly alleviated when Lynnwood Link arrives–and much appreciated if climate change really does result in more lowland snowfall (though I kind of doubt it). Snow plows are out in Lynnwood and MLT, I saw a couple of them remove the top dusting of snow and it didn’t do a thing for the ice below it. Plus they haven’t even touched the local residential streets, and I didn’t see any of the condo and apartment lots getting plowed. This is gonna stick around for awhile and only get more icy throughout the week. Snow chains! Hence the taking it slow. New experience for me. PS pre-treating, plowing and deicing transit centers was clearly *not* on the priority list! While I had the good fortune of being able to work from home today, I think I’ll have to make the journey in tomorrow when things will be well-iced overnight. I’m definitely grateful that I can leave the driving to the professionals, despite the reroutes!